Cross the Lions Gate Bridge and enjoy the temperate rainforest of Vancouver’s North Shore. Visit the Capilano Suspension Bridge Park, home of one of the world’s longest suspension footbridge and cliff walk – a path cantilevered to the granite cliff-side. Step aboard the famous Grouse Mountain Gondola – a tram that travels one aerial mile to the Peak Chalet for the seasonal entertainment including live performances and the wildlife refuge for two orphaned grizzly bears. This is a great option for a chance to view the stunning nature that surrounds the city. Take in the spectacular skyline as you travel across the historic Lions Gate Bridge, which was built in 1937. Next up is the Capilano Suspension Bridge Park where you can cross one of the world’s longest suspension footbridge. Prepare yourself to walk 450 feet across and 230 feet above the Capilano River! Visit the Treetops Adventure forest canopy and the Cliffwalk for a heart stopping cliff side journey. 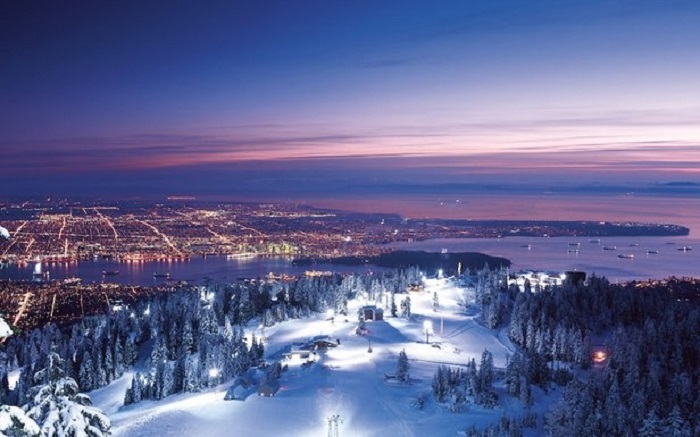 Take the Gondola up Grouse Mountain to a viewpoint 3,700 feet above the city. Enjoy the array of activities, and explore the Refuge of Endangered Wildlife, home to two grizzly bears. There is plenty to explore at this resort, along with several dining options and Theatre in the Sky. After creating some long lasting memories visiting two of Vancouver’s hot spots, your tour will conclude at your starting point. Book your Peak & Canyon Tour with Alpine North Limousines Today!